Please stop shark finning. Save our sharks. 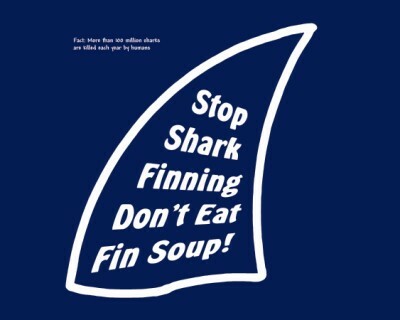 Don’t eat shark fin soup! There are so many things we shouldn’t eat. But I often feel I am in no position to tell other people in other countries or cultures what they should and shouldn’t be eating. I myself eat pork and beef which are forbidden in some Asian countries so who am I to tell Koreans to stop eating Dogs and the French to stop eating horses. (2 animals which I consider pets or even friends). It’s a tough and often sad world we live in! I agree with you Janet. But we are the ones who have to step forward and take action. It is sad to see people continuing eating dogs and horses, just like you said because they are considered as pets! I know how you feel when you say you are being in no position to tell but you do have the right!